Find a Way Jose is a fun free sliding block puzzle app for your iPhone, iPod touch, and iPad from Baruch Richter. Jose has lost his “potion,” stored in a bottle strikingly reminiscent of a Tequila bottle, and it’s your job to solve puzzles to help him find it. With bright graphics and a cute soundtrack, you move from level to level moving obstacles to clear a safe path for Jose. The Find a Way Jose iPhone and iPad app contains six worlds and 60 puzzles to challenge you and make you laugh. Each puzzle has a different shape, and the obstacles encountered and blocks moved are constantly changing to keep you on your toes. As soon as you touch the play arrow, the mariachi sound track and the clock start. At the top of the screen, you are also trying to beat the lowest number of moves possible to complete the level. The Find a Way Jose iPhone and iPad app gives you points based on how well you compare to the best performance possible for each level. The clock moves quickly, and the new perspective of a changing puzzle and obstacles creates excitement and energy. With agile response to gestures as you slide cubes, rectangles, L-shaped boxes, and columns, you work to open a path for Jose to successfully reunite with his potion. Each obstacle and block has a fun graphic with typical desert inconveniences like snakes, spiders, and cacti. You also earn points by collecting skulls along the way. 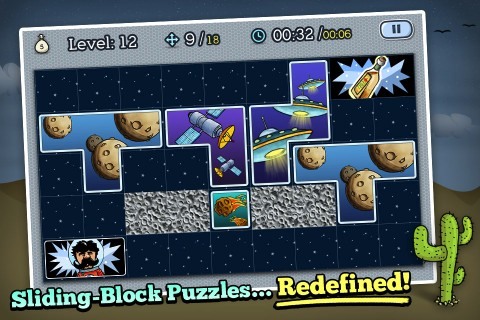 The Find a Way Jose iPhone and iPad app has logical progression as you move through levels. You must be successful, or buy your way to the next level with points or in-app purchase. You can follow your progress on the Leader Board by integrating with Game Center. After you have completed each level, you have the opportunity to share your findings with Facebook and Twitter. A full version of Find a Way Jose can be purchased for $1.99 via in-app purchase to unlock the surprise ending and the ability to construct levels. 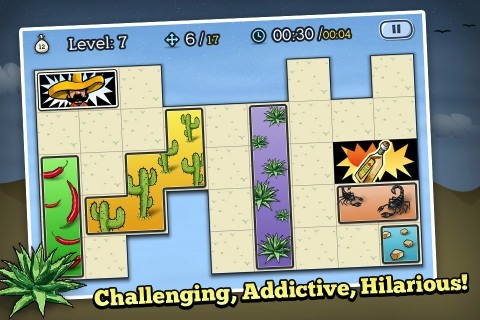 With a fun RoadRunner meets 21st century aesthetic and polished graphics, Find a Way Jose game for iPhone and iPad delivers light humor and addictive brain teasers that puzzle nerds will love. AppSafari review of Find a Way Jose was written by Jenni Ward on April 26th, 2012 and categorized under App Store, Featured, Free, Games, iPad apps, Puzzler, Universal. Page viewed 6402 times, 4 so far today. Need help on using these apps? Please read the Help Page. Amazing game.Really a brain teaser for me.The puzzle are absolutely amazing.